Many of us can recall a life-altering moment when we knew our lives would forever be defined as Before and After. For some, it's a happy, memorable experience. For others, it's a tragedy that forever shakes us. For author Alexa Bigwarfe, it was the latter. Alexa lost her baby girl at just two days old and watched her other daughter, the identical twin, struggle to survive in the NICU for 84 days. But instead of allowing those experiences to crush her, she found a way to channel that into something positive - a book for other grieving mothers, which to date, has helped mothers from all over deal with their overwhelming loss. After self-publishing her book, she learned she had a gift that she could help other women with : the ability to not only see the story inside themselves, but to help them bring it out, write it down, and sell it. Write, Publish, Sell is Alexa's company dedicated to providing women with author support services (everything from proofreading, managing blog tours for authors, to social media support for authors and more). She also founded Kat Biggie Press which has helped women navigate the often confusing world of publishing and to give them support along their journeys. Kat Biggie Press has published ten books from women authors and continues to search for other female authors with a story to tell. In addition, Alexa has developed plenty of resources to help authors: From Idea to Outline in 1 Hour, course (just $17!) to get you started on your road to publishing, and the Just Write It! 30 Day Challenge, course (FREE!) to give you 30 simple strategies to write the book inside you. Plus the Write, Publish, Sell Academy to help authors on their way to publishing AND the Ditch the Fear and Just Write It! workbook to help you get your book down on paper. No matter where you are in your publishing journey - whether it's in the beginning stages of getting your ideas onto paper, or learning how to market your book, Alexa is your cheerleader along the way, giving you her experience and knowledge to make your journey as successful as possible. Win a copy of the Ditch the Fear and Just Write It! workbook. Head to our Giveaways page to enter. You KNOW you have a book in you, you KNOW you want to write and publish a book. But as soon as you start thinking about it, your palms get sweaty, you start to breathe faster, you come up with a MILLION reasons why no one would read or buy your book. So, you put it off. Again. Stop doing that! Yes, writing a book is overwhelming! Yes, there are a lot of excuses that may stop you from moving forward. Yes, there are a TON of things you have to do beyond JUST WRITING to get your book published. Yes, hiring a coach to help you through the process and get your book published is expensive. But at the end of the day, if you don't JUST WRITE IT! you will spend the rest of your life wondering WHAT IF? Don't be that person who watches book launch after book launch and thinks - that should have been me. Ditch the Fear and Just Write It! 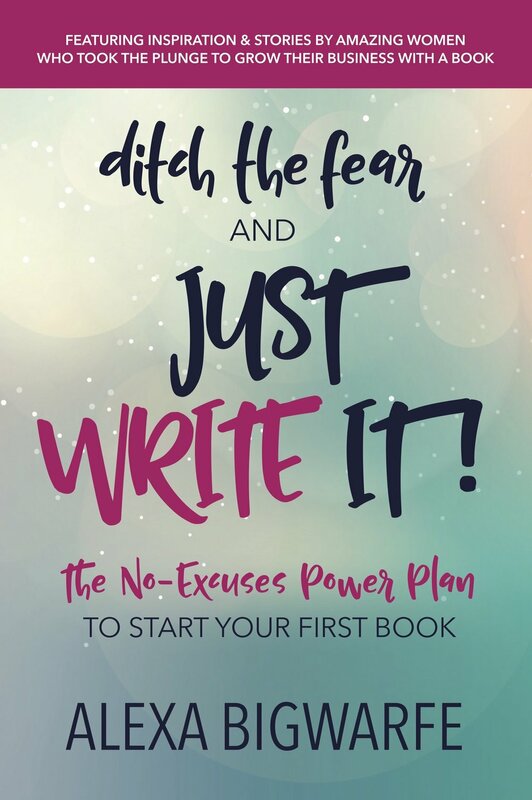 The No Excuses Power Plan to Start Your First Book is the answer to your problem. Space to journal your thoughts, if that's your thing. If you're committed to writing your book and you know you need help to get it done but don't have the funds to invest in an author coach to get you through the process, this is the BOOK FOR YOU. This post was written by Holl & Lane in paid partnership with Alexa Bigwarfe of Write, Publish, Sell. We only work with companies and brands that we truly believe in.